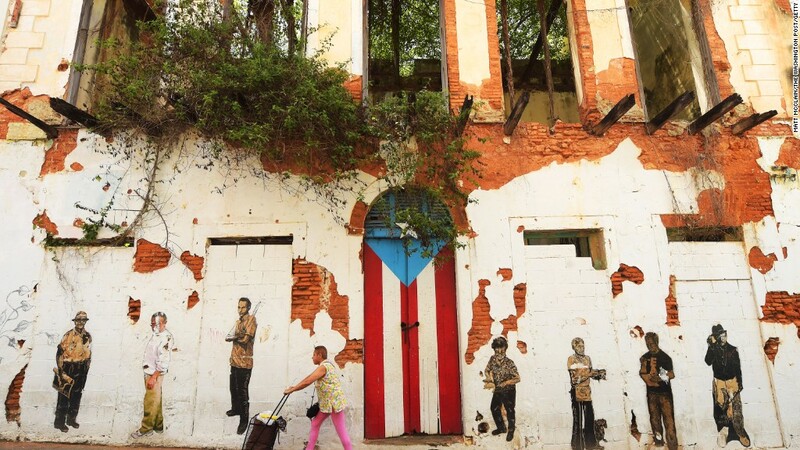 Puerto Rico's debt crisis: How did it get so bad? 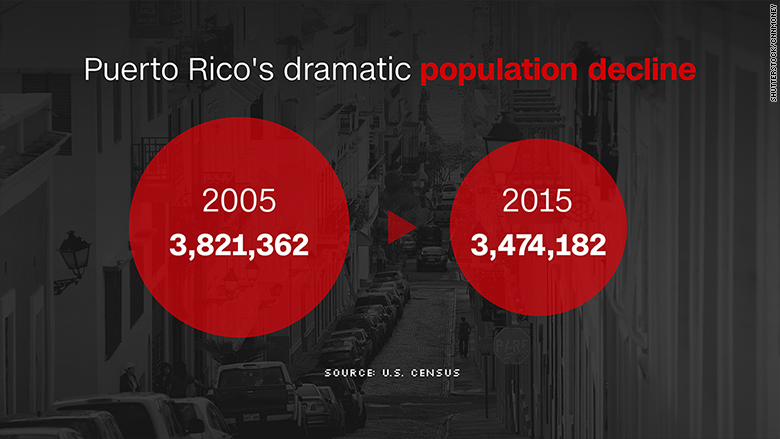 Puerto Rico's crisis: How did it get so bad? Puerto Rico is supposed to be America's paradise island. The temperature rarely falls below 70 degrees and it's smack in the middle of the clear, warm Caribbean sea. Actor Johnny Depp, who owns a nearby island, says that part of the world "can add years to your life." Yet Puerto Rico today is in crisis. "America's Greece," some say. It's makes more headlines for its unpaid $70 billion debt than its paradise beaches. For years, Puerto Rico's government spent more money than it took in from taxes. American states are required to craft balanced budgets every year, but Puerto Rican leaders didn't, taking advantage of the island's limbo status -- it's not a state, it's a U.S. territory. The big spending was fueled by a translation error between Spanish and English in the island's 1952 constitution. 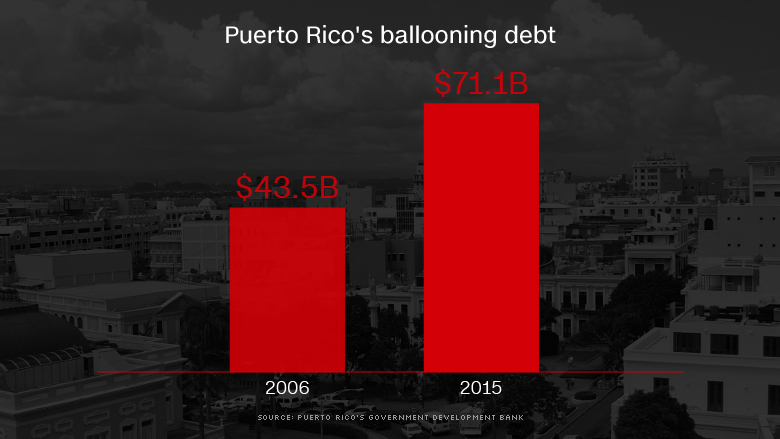 It enabled Puerto Rico to issue debt to fund many activities, including day-to-day operations. It all comes down to the interpretation of the phrase "recursos totales" -- total revenue or total resources? It was interpreted as resources, which is a broader term allowing the government to fund regular operations (e.g. education, policing, health care, etc.) via bonds. Puerto Rico issued debt many times over the years. But it really skyrocketed in the the past decade, when total debt went from an already hefty $43.5 billion in 2006 to over $70 billion by 2014. (The island also has over $40 billion in unfunded pension liabilities). So what happened 10 years ago? Congress is partly to blame for the mess. The island used to be a tax haven for some big businesses such as the pharmaceutical industry. It was cheaper to make drugs on the island than anywhere else in America because companies didn't have to pay federal tax on the Puerto Rican operations. But in the mid-1990s, Congress began rolling back the special tax exemptions for businesses operating in Puerto Rico. The tax breaks phased out and fully ended in 2006. Puerto Rico's economy tanked after this happened, and it has yet to recover. Many good private sector jobs were lost and tax revenues dropped. The economy has shrunk almost every year since. Residents are literally fleeing Puerto Rico, packing up and moving to the mainland U.S. in an exodus not seen since the "West Side Story" era of the 1950s. It's harder and harder to find a job. The unemployment rate is 11.8%, more than double the U.S. national rate. What is especially worrying is that Puerto Rico is losing talented and skilled workers. A doctor a day (or sometimes two or three) leaves the island. Skilled professionals like doctors can get higher pay in the mainland U.S., and they just don't see a clear path for the island to turn itself around. Families with young children -- the future workforce -- are also departing. The shortage of medical workers has made the Zika virus outbreak in Puerto Rico even harder to handle. The island suffered the first death from Zika in the U.S., the Centers for Disease Control and Prevention confirmed. Another major drawback for Puerto Rico is that it doesn't have access to the same bankruptcy laws that states do. So-called Chapter 9 bankruptcy was created after the Great Depression to allow cities, towns and other municipalities to address severe debt problems under a workout process overseen by the courts. Detroit is the most famous Chapter 9 bankruptcy case so far. Puerto Rico used to have Chapter 9 bankruptcy rights, but the island lost them in the 1980s when Congress revisited this part of the bankruptcy code. The Obama administration and the governor of Puerto Rico argue that it was an unfair decision and that Congress should give the island Chapter 9 rights again. So far, the Republican-controlled Congress is largely against it. Many experts believe some sort of debt restructuring will be necessary. It may mean delaying payments to creditors or paying less than 100% back. The problem is Puerto Rico is in legal limbo. Neither the island, nor the creditors, want to budge much in negotiations until they know what the laws are for sure. There's a case sitting at the Supreme Court that could alter the rules, and Congress is debating a bill that could also change everything. "We're very far from the end," says Philip Fischer, the managing director of municipal bond research at Bank of America Merrill Lynch.